The National Small College Rugby Organization (pronounced “N”-SCRO) was co-founded by Steve Cohen and Chip Auscavitch in 2007 to organize the Division 3 and Division 4 college rugby national playoff system and continues to be run by Steve Cohen. These championships have become a vital part in developing collegiate rugby in the U.S. and are now known as the Small College National Championships. The best small college rugby clubs are just that and to refer to them as Division 3 does not fully recognize their level of play, commitment to the sport and accomplishments both on and off the pitch. NSCRO is the Home of Small College Rugby in America and we encourage all small colleges to participate in our playoff system. At the beginning which Steve Cohen started in 2002 for men and 2003 for women as an East Coast Championship, there was less than 80 men’s and 40 men’s colleges participating. Now as NSCRO there are currently over 240 men's and over 125 women's teams participating in local Unions and Conferences with their eye on the prize of the NSCRO Small College National Championship. This represents nearly 40% of all colleges playing rugby in the U.S. In late 2012, NSCRO and USA Rugby reached an agreement that provides NSCRO with USA Rugby’s support and recognition of NSCRO as an independent organization, sharing similar goals for bettering the collegiate rugby experience. One of NSCRO goals is to establish a "level playing field" for small colleges to compete against schools with similar resources, especially in terms of student enrollment. Since NSCRO was formed we have had a goal to continually better the "stage" for players to showcase their talents. We strive to find excellent hosts for our National Championship events. For men we were hosted at Wake Forest University in 2007, Hamilton College in 2008 and the South Jersey RFC in 2009. In 2010 and again in 2011 we 'raised the bar' with the use of the outstanding Virginia Beach Sportsplex Stadium. In 2011, we added "live web streaming" of all matches as well as post-event DVD production. In 2012, we took 2 major steps forward in raising the profile of Small College Rugby by holding the National Championship event at Infinity Park stadium in Glendale, CO and by providing National television coverage of the semifinal matches by FOX Soccer Plus. Our men’s National Championship continues to be held at Infinity Park. In 2015, we added a new men’s playoff system called The Challenge Cup. We hold the Challenge Cup National Championship at Founders Field near Pittsburgh, PA. Founders Field is one of the premier rugby facilities in the country. Since 2016, our Women's 15s National Championship has been held at the outstanding rugby facility at Life University in Marietta, GA.
NSCRO provides free live streaming of all of our Men’s and Women’s National Championships. For complete info on NSCRO 15s, go to http://www.nscro.org/page/show/1326490-nscro-15s-clubs-and-rankings. In 2013, NSCRO held its first Men’s 7s National Championship. It was done in conjunction with United World Sports’ (formerly USA Sevens) Collegiate Rugby Championship (CRC 7s) at PPL Park. NSCRO continues to hold its 7s Championship at the CRC 7s which showcases our small colleges alongside the “big” schools. Our final is played inside the stadium in front of 10,000 fans. In 2014, NSCRO held its inaugural Women’s National 7s Championship at Grand Valley State University in Allendale, Michigan in conjunction with ACRA’s 7s Championship. In 2015, West Point (home of the Army RFC) hosted the combined ACRA/NSCRO 7s Championship. In 2016, NSCRO expanded its Championship from 6 teams in 2014 and 8 teams in 2015 to 12 teams. It was held at the Rugby Athletic Center in Charlotte, NC. For complete information on NSCRO 7s, click here. In 2016, under the leadership of Bryn Chivers, NSCRO Commissioner of Women’s Rugby and thanks to the financial support of Penn Mutual Life Insurance Co., the NSCRO/Penn Mutual Women’s 7s Select Side was established. 14 players were selected to the team representing 11 different NSCRO schools. The team participated in the 16-team women’s division at the CRC 7s and finished 5th. Read about it at http://www.nscro.org/news_article/show/658501?referrer_id=1276237. 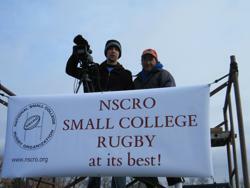 NSCRO is the home of Small College Rugby in America and is dedicated to its growth and development.